There are rules and regulations protecting tenants’ rights in the Netherlands. Many tenants, especially expats, aren’t sufficiently aware of this. The !WOON tenant support agency (funded by the Amsterdam municipality) provides information, advice and support for tenants and owner-occupants. Confidentially and free of charge. By giving internationals more insight into the Dutch rental market and their rights and obligations as tenants we hope to contribute to their stay in Amsterdam. !WOON has offices all over the city with regular walk-ins (no appointment necessary). We also have a special department for extreme situations involving intimidation etc, called the Meldpunt. You can also find us on Wednesday from 9-10 AM at IN Amsterdam. Amsterdam has a major shortage of affordable housing. Please note finding accommodation can take more time and effort than you were expecting. There are waiting lists for rent controlled individual housing and it can literally take decades to qualify. www.rooftrack.nl lists immediately available housing. You can try funda.nl/huur and pararius.nl, you could also contact an estate agent. National realtors’ organisations NVM and their Amsterdam department MVA or VBO have complaints procedures. So if something should go wrong, they are more reliable than non-affiliated agencies who don’t have such procedures. Please make sure a housing offer is legitimate. Check the address, the landlord and the letting agent via an internet search or through the Kadaster property register. Under Dutch law a contract can already be reached by mutual agreement, even if nothing has been signed yet. If a landlord agrees to let tenants use the living accommodation and to accept their rental payments in return, that is a legally binding contract. Tenants in this situation are protected by Dutch rental law, with all of the same tenants’ rights and obligations as tenants who do have written contracts. In fact, tenants without written contracts can sometimes even be better off. Written contracts often contain restrictions to the tenants (such as a “no sub-letting” clause) which otherwise wouldn’t apply. Please note that this also means that if tenants asked to rent an apartment by a certain date and the landlord or agent accepted, they could already be legally bound by a contractual agreement. Which could mean that if the tenants changed their minds and decided to rent a different apartment the only way out of the first apartment would be to give notice. The legal notice period is usually one month so they could still be obliged to pay at least one month’s rent on the first one. If you are looking to rent an apartment in Amsterdam, or in the rest of the Netherlands, here are some safety tips you might want to keep in mind. A lot of internationals living in Amsterdam have paid a fee to an agent. According Dutch law in most cases this is not allowed. Here’s what you can do if you did pay a fee. If you rented an apartment in the past five years and you were charged agency fees, usually about a month’s rent plus taxes, this might not have been legal. 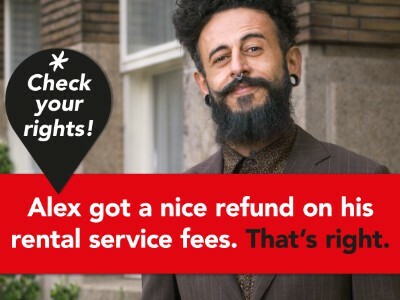 If so, you might be able to claim a refund. This article offers guidelines on how to do this. Your contract should clearly differentiate between basic rent (“kale huur”) and additional costs like utilities, furnishing, cleaning costs etc. (΅service kosten”). So called “all-in” rent, without this clear distinction, is illegal and might be significantly lowered by the Huurcommissie national tenancy tribunal. The basic rent is either controlled or free. Free market rent means there is no maximum rent. Landlords can ask what they want and tenants can decide whether or not they want to rent the apartment for that price. Rent control means there is a legal maximum rent. The rent is determined by a points system based on size, location and amenities If tenants are charged more than the maximum legal rent they can petition the Huurcommissie national tenancy tribunal to have their rent lowered. Please note that when the basic rent for an apartment that should be rent controlled is more than €710,68 tenants can only petition the Huurcommissie during the first six months of their tenancy! After these six months have passed this will no longer be possible. Exception: in case of specific temporary contracts tenants can petition the Huurcommissie within six months after the end of the contract. If the rent is proven to be too high you can claim a refund over the full tenancy period. When tenants share the kitchen and / or bathroom and / or toilet facilities and they are renting their room directly from their landlord (“kamerhuur”) this is always rent controlled. These tenants can always petition the Huurcommissie to lower their rent if they are being charged too much. Within the first six months of the contract the rent can even be lowered retro-actively. If house-sharing tenants do not have individual contracts but instead are renting the entire apartment with all of their names on one contract, this is usually not rent controlled. Each of the tenants could be held legally responsible for all of the rent for the entire apartment, even if the individual has moved out. To establish whether an apartment is rent controlled, and what the maximum rent would be, !WOON can make free points calculations for tenants living in Amsterdam. For appointments please contact the !WOON office in your area. Tenants can also do their own calculations using this online tool for individual housing and this one for a room with shared facilities: If you have any questions please contact the !WOON office in your area. The annual rent increase does not apply to the service costs / additional rental costs, it only covers the basic rent. The annual rent increase percentage for rent controlled housing is set by the government. Landlords have to notify tenants at least two months in advance. For free market there is no such mandatory minimum term. Free market contracts often include an indexation clause covering the annual rent increase. The contract then states which percentage or inflation percentage will apply. If the clause in your contract is based on the consumer price index (CPI) you can check your rent increase using this online tool. Contracts should clearly specify the basic rent and the charges for other things like utitilities, furnishing, cleaning, internet connections etc. For both rent controlled and free market housing these costs are strictly regulated. Landlords can only charge for the items listed in the contract, and only for the actual cost. Tenants pay monthly advance payments and each year they should receive a final calculation (“jaarafrekening servicekosten. This bill should include a clear and specific list of the items on the bill, and balance the tenants’ advance payments with the actual costs. Built-in appliances are already included in the basic rent. They cannot be included in the service costs. For new non-durable goods (like small household appliances) the maximum charge per year is 20% of the purchase price. After 5 years the goods need to be re-appraised for their second hand value. For more durable goods (like washing machines or refrigerators) the write-off period is 10 years and the maximum annual charge is 10 %. Tenants should receive the annual service cost balance before July 1st of the following year. If landlords have not provided the annual balance they cannot raise the monthly advance payments. Tenants in rent controlled housing who don’t agree with their service cost payments or didn’t receive their annual service cost balance can petition the Huurcommissie national tenancy tribunal. This has to be done within two and a half years. Tenants in free market housing cannot petition the Huurcommissie, they have to go to court (“kantonrechter”). The law outranks any contract. Despite what individual contracts might say, under Dutch law the majority of contracts that started before July 2016 do not have a fixed end date. Fixed time periods in these contracts are often minimum terms only, not maximum terms. Signing so-called “extensions” for such contracts is not only unnecessary, but can even harm tenants’ rights instead of improving them. If their contract is indefinite, with no fixed end date, tenants can already stay as long as they want and leave when they want, provided they give one month’s notice. By signing such an “extension” tenants could be committing to yet another minimum rental period, and possibly even giving notice by agreeing to an end date for their contract. Since July 1st 2016 private landlords can include a fixed end date within two years for individual housing and five years for shared housing. If such a contract gets extended it automatically become indefinite, regardless of the duration of the extension. Minimum rental terms in fixed term contracts are no longer expected to hold up in court. Contracts with minimum rental terms of more than two years for individual housing or five years for shared housing will be considered indefinite, with no fixed end date. In general, residents of shared housing have the same security of tenure as residents of individual housing. An exception is made for tenants renting a room from a landlord who lives in the same apartment (“hospita verhuur”). In this situation landlords are allowed to end the contract during the first nine months of the tenancy, giving at least three months’ notice. After the first nine months have passed “hospita” landlords can no longer do this. If a group of tenants rent an apartment together with all of their names on the contract (“contractuele medehuur”) they have not rented individual rooms. Instead, the tenants can divide the rooms amongst each other as they wish. Some contracts allow tenants to move out and the remaining tenants to select new tenants (“coöptatie”), but some don’t. Other contracts might not allow individual tenants to leave. Sublets are only allowed with the landlord’s permission. Many contracts contain legally binding “no sublets” clauses. Tenants illegally subletting to others can be evicted, as can their sublets. Under European law tenants have a right to family, which means their partners and children are allowed to live with them and are not considered sublets. Housing up for sale can be temporarily rented out, provided the landlord has a “Leegstandwet” permit included in the contract. Social housing companies (“woningcorporaties”) can only offer temporary contracts to specific tenants such as students, with the contract ending when their studies end. Anti-kraak (anti-squatting) is a form of live-in guardianship of a vacant building. Although not illegal it is not considered tenancy and residents do not have tenants’ rights. This does mean that instead of being charged full rent they can only be charged a usage fee, which should be considerably lower. For more info on the rights of anti-kraak residents please contact the Bond Precaire Woonvormen. Accommodation reserved via AirBnB, Wimdu etc. is also not considered tenancy. Instead it is comparable to booking a hotel room, not housing. Residents do not have tenants’ rights. If the holiday accommodation is being rented out illegally residents can be evicted. In general landlords have to pay for bigger more expensive repairs and maintenance requiring specialist skills. Tenants have to pay for simple inexpensive repairs that don’t require specialist skills, to easily accessible areas. Built-in appliances are considered to be part of the building, included in the rent, and their maintenance is the landlords’ responsibility. Landlords are responsible for the maintenance of any furnishing and un-attached appliances rented to their tenants. The charges for for furnishing and appliances should be listed in the contract as “service cost” monthly advance payments. Tenants are responsible for any damage they have caused, except for regular wear and tear. Some landlords offer service contracts where in exchange for a monthly fee (usually around € 5 / € 6) they also do the maintenance for which tenants are responsible. Larger repairs and replacing hinges, screens etc. Maintaining / cleaning / lubricating hinges, screens etc. Tenants should give their landlords reasonable time to fix the maintenance problems. If landlords are not willing to do the necessary repairs then tenants in rent controlled housing can petition the Huurcommissie tenancy tribunal to lower their rent until the repairs have been done. If tenants in free market housing are having problems getting the maintenance done they can write their landlord that if the repairs don’t get done the tenants will have to call in the maintenance people themselves, hold their landlord responsible for the costs, and will be planning to deduct this from their rental payments. In case of an emergency (for example when the heater broke and it’s freezing outside, or when the plumbing broke and the toilet can’t be used, and the landlord’s nowhere to be found then tenants can also contact maintenance directly and hold their landlord responsible for the costs. Of course in situations like these tenants can only demand reasonable refunds and only for professionally done repairs of good quality. It is therefore very important to get realistic quotes (preferably several) and only hire qualified maintenance people. When renting out living accommodation landlords can ask for a deposit. The amount is usually one months’ basic rent (“kale huur”: the rental costs without additional charges for things like furnishing or utitilities). This deposit is only meant to cover the repairs of any damage done to the apartment during the rental period. It cannot be used to cover any other money still owed by tenants (such as back rent, or outstanding utility bills) unless this has been agreed in advance, in writing, by both landlord and tenant. Regular wear and tear is not considered damage. Tenants are responsible for indoor painting and small and inexpensive maintenance (like replacing a broken showerhead), landlords have to take care of more specialist and costly maintenance (like repairing a broken water pipe). The cost of this maintenance is already included in the basic rent. Tenants should notify their landlord, preferably in writing, if there are any maintenance problems during their stay. When expat tenants become more aware of Dutch rules and regulations regarding housing they greatly improve their chances of being treated fairly in the Dutch housing market. Some of the common topics like security of tenure, deposits, agency fees, rent, service charges, maintenance problems, etc. are discussed briefly in this folder. The 3 housing corporations which let studentflats in Amsterdam used to work together in the organization “studentenwoningweb”. Now they have started another site. You can find information and a registrationform on Studentenwoningweb and on ROOM.